Whether traveling the world for work or hitting serves on the tennis court, business executive and philanthropist Jonathan Lavine hardly sits still. But his busy routine sometimes gets sidetracked by migraines—severe headaches he has experienced since age 6. Despite their prevalence—he’s one of 39 million sufferers in the United States—migraines remain poorly understood and difficult to treat. Lavine started to experience relief three years ago after seeing Carolyn Bernstein, MD, FAHS, a neurologist with the Graham Headache Center at Brigham and Women’s Faulkner Hospital. Bernstein works with patients to supplement medication with integrative healing approaches—including acupuncture, chiropractic care, and therapeutic massage—methods espoused by the Osher Center for Integrative Medicine at Brigham and Women’s Hospital, where she is also on staff. 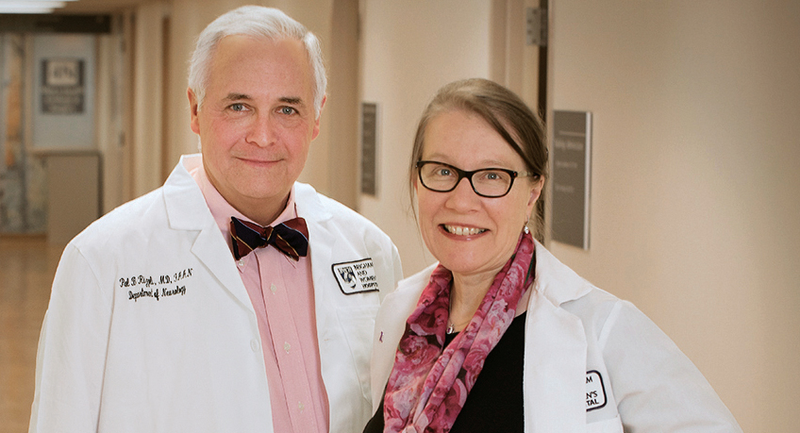 Inspired by his improved health and Bernstein’s vision for migraine research, he and his wife, Jeannie, have given $500,000 through their family foundation to create the Lavine Family Research Initiative at BWH. In addition to supporting research, the Lavines’ gift will help to make integrative therapies available to more patients through the BWH patient assistance and access fund. “Migraines can be debilitating, so if we can help Dr. Bernstein advance her work and make it accessible to patients throughout the country, we’re all too happy to help do that,” says Lavine.